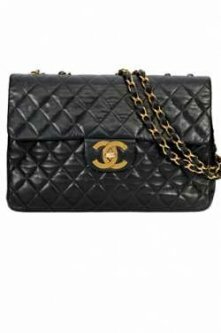 We all love a nice handbag but the Chanel 2.55 is much more than that. The inspiration behind Coco Chanel's original design goes deeper than most of us realise. Female First look at the story behind one of our favourite ever handbags. The 2.55 bag was first introduced in February 1955- hence the name 2.55. Coco Chanel designed the bag for her own use so some of the features tell us a little bit about her lifestyle as the original fashionista. 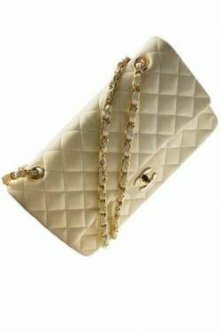 When it was first brought out the Chanel 2.55 caused a stir amoungst the upmarket fashion lovers because it was one of the first to have a strap. Coco recognised that women on the go needed to have their hands free to hold glasses of champagne, eat canapes, read theatre programmes etc so the chain strap was added to make the bag easy to carry on the shoulder. But this isn't the only reason why the 2.55 bag is such a fashion icon- it also tells the story of the life of Coco Chanel as she went from riches to rags and back again. Gabrielle Bonheur âCocoâ Chanel was born the daughter of a doctor and a lawyer, Brigitte and Johan Chanel. She devolped an interest in fashion from a very young age after her mother took various tailors and showed her around the land of clothing and needles. However her mother was killed in a bizaare boating accident, leaving Johan to take care of Coco and her brother, Lawrence on his own. Johan couldn't get over the death of his wife and committed suicide six months later leaving Coco to the care of an orphanage. Following the tragic death of both her parents Coco became sad and withdrawn and in fact she didn't speak at all from her father's death until she was six. Her only comfort was the sketches she loved to do. Coco's time in the orphanage had a big impact on her life and influenced her future designs. The double chain design of the shoulder strap strap was inspired by her memories of the childrenâsâ caretakers in the orphanage who would dangle keys from their waists. The brown/red colour on the inside of the 2.55 bag in fact represents the colour of the uniforms Coco and the rest of the children had to wear in the orphanage. It wasn't only Coco's childhood that went into her designing. The 2.55 also has an secret compartment in the inside of the front flap and this is rumoured to be where Coco would keep her love letters during an affair she had with Nazi spy, Hans Gunther von Dincklage. Another secret pocket is featured in the outside flap at the back of the bag. This is where Coco would keep a little bit of extra money she wanted to stash away. The quilted material from which the bag was made was based on the coats worn by jockeys. It was believed that Coco was fascinated by horse racing and wanted to pay tribute to that in the very personal design of the 2.55 bag. Coco chose to close all her shops during the Second World War and took up residence in the Hotel Ritz in Paris throughout the fighting. It's rumoured that it was her relationship with Von Dicklage that allowed her to remain there. 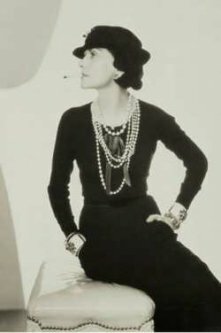 When the war was over Coco and the Chanel brand struggled to make a come back in the fashion industry- mostly due to her romance with the Nazi but she continued to live in the Ritz for 30 years until she died in her private suite on January 10, 1971, at 87 years old. Since Coco's original design there have been many variations of the original design 2.55, including different colour leather/fabric, changes to the chain - metal vs. interwoven leather- and the fasten - mademoiselle vs. interlocking CC. In 2005 Karl Lagerfeld revived the 2.55 design exactly as Coco had made it for it's 50th anniversary and the new Reissue was even more popular than the original release. Although Chanel 2.55 may just look like another designer bag each aspect of it's design contains a little part of the fashion icon that was Coco Chanel- therefore making it a true icon of fashion itself.